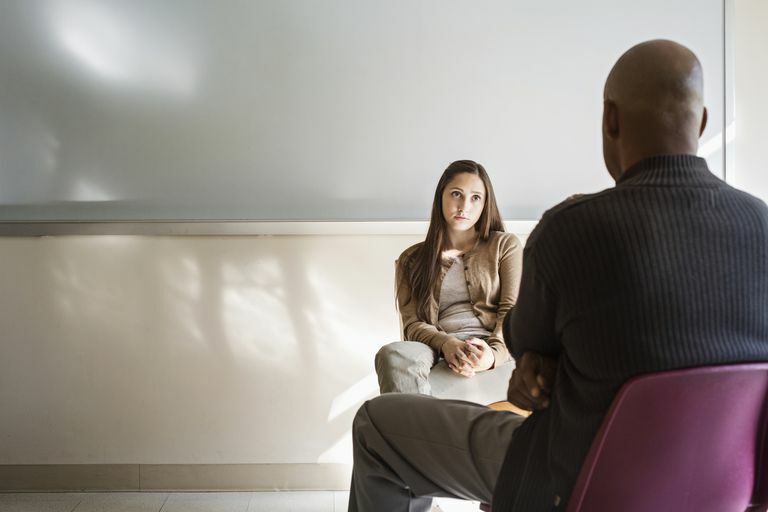 Rational emotive behavior therapy (REBT) is a type of therapy that deals with overcoming irrational beliefs and changing your reactions to the negative events that happen in your life. According to REBT, your reaction (C) is the result of your belief (B) and not caused directly by the event (A). The goal of REBT is to change your belief (B) so that your reaction (C) also changes. This is done through a process known as disputation, which is usually completed with the help of a therapist. For example, imagine that you have a fear of making introductions. Perhaps you aren't sure of the etiquette, worry that you will forget someone's name, or just feel too anxious to even make introductions or introduce yourself to others. In situations where introductions are required, you might avoid speaking or wait until other people introduce themselves. Below is a sample conversation that you might have with your therapist about this fear. Client: I feel afraid to introduce people like I might say the wrong thing or embarrass myself. When I have to introduce myself, I feel awkward and usually end up saying nothing. Strangers probably think I am stuck up, but I just feel too anxious to do anything. Therapist: So you are afraid that other people will think you are bad at making introductions. What is so bad about that? Client: I'm not really sure, but I just can't seem to do it. I feel awkward. Therapist: So other people end up thinking you are a snob. So? Client: Well, it's hard to make friends when you make a bad impression. Therapist: Well, the main problem is the pressure you put on yourself to make the introduction. It makes you overly anxious about the situation to the point that you do nothing. I MUST come across well to others or else I'm worthless. I MUST be socially competent or else I am no good. I MUST not make mistakes in social situations or I am a misfit. One technique to work on these "must" statements is to write them down on index cards with more rational statements written on the reverse of each card. For every "must" statement, you and your therapist might come up with four or five healthier replacement beliefs. FRONT OF FLASHCARD: "I must come across well to others." "I might like to look good all the time, but I don't have to." "It's not horrible if I make a mistake introducing people." "Even if I don't introduce myself, people won't hate me." "Even if I forget to make introductions, it's not the end of the world." Your therapist would then have you look at these cards whenever you have a few minutes in your day to practice your new ways of thinking. Eventually, you will learn that it is not making introductions that makes you anxious, but rather the demands that you put on yourself that it must go well. Even if you never get better at making introductions, you can be less anxious about the whole experience. As a way of extending your irrational thoughts even farther, imagine the worst case scenario: Everyone you know starts avoiding you because you are bad at making introductions. When you can get to the point of seeing your fears as ridiculous, you can start to let them go. In addition to working through your irrational beliefs, you can also take steps to improve your social skills and learn about etiquette in the areas that make you uncomfortable. In summary, the basic premise of REBT when applied to social anxiety is to work on overcoming the irrational belief that everyone must like and approve of you in order for you to be of value. The process is usually done through a series of questions known as disputation with a trained therapist, though you can also practice replacing beliefs on your own. At the heart of REBT is the notion that you make the situations in your life better or worse depending on how you think about them. REBT Network. What is REBT? Three Minute Therapy. REBT Therapy. Three Minute Therapy. Social Anxiety: To Hug or Not.